In January, I wrote about a plan by an Ohio school board to arm janitors in schools. Needless to say, I didn't think much of it. Two recent proposals are even more absurd. A brief Homeland Security video opens with a helpful definition of an "active shooter." There is some worthwhile advice about taking cover, hiding and what do when police arrive. The big problem is that the video suggests if you are caught in the open, you should consider trying to overpower the shooter with scissors. If you are caught in the open, where are you going to find scissors? Your Swiss Army knife? If you are in an office, as depicted in the video, you would probably be better off hiding or playing dead. As odd as that advice seems, it doesn't come close to this hare-brained device. 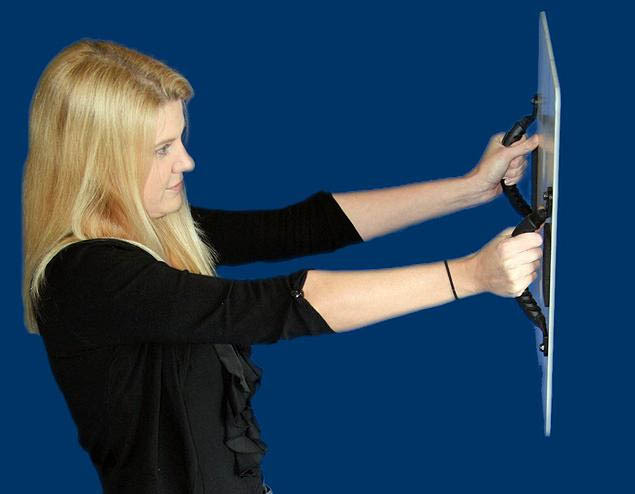 The NY Daily News reports that a company is marketing bulletproof whiteboards for teachers. In peaceful times, it's like any other whiteboard. But when the shooting starts, the teacher can hold up the 18-by-20-inch slab for protection. The article has a few pictures of it in action. Here's one. The article says, "Several schools, including two grade schools in Maryland, a high school in North Dakota and the University of Delaware, have already ordered or installed the boards." They cost $299.00 each. Questions come to mind. Doesn't it look like there is plenty of unprotected teacher to shoot at? What about the children? Will they have white boards? What if the teacher doesn't have the white board in her hand when the shooter enters the room? I guess she can always fall back on the scissors. Yes, indeed quite stupid...as are the schools which are purchasing these! WTH? At $299.00 each. Hard to believe. I would buy a bigger white board. Good idea. Maybe surrounding all of the teachers and students with bulletproof whiteboards is the answer. People whose body armor is struck by pistol bullets often suffer injuries such as rib fractures and internal hemorrhage. A few police officers have died from those injuries even when their armor isn't penetrated (and at least one has died when it was). If somehow the teacher managed to block a shot with the whiteboard, wouldn't he or she be likely to be knocked over, suffer hand and arm injuries, and have the board torn away by the impact? What my uncle used to say about cheap Chinese tools applies here: "Made to be sold, not to be used." Dave, good points. I agree with all of them. I had a similar 'conversation' with a young couple who believed that the teacher should have a gun. Like the whiteboard, the teacher would have to have the gun strapped to him/her in order to be useful in the very rare event someone came in shooting. And with the gun in the open it isn't the gunman through the door that could be the danger, it would be a curious or angry child that could use it. They insisted that while a couple of kids may be killed while teacher was going for the gun (if it were in the desk) it would have lessened the number of deaths in Connecticut. But if the gun was in the desk then snooping kids would find it (my gr. 5 teacher had Scotch in his desk). Then there is the skill of the teacher's shooting, who would pay for the training and practice that is needed for the teacher to be comfortable killing someone? And shooting past their students? Like the whiteboard, it doesn't flesh out to be reasonable or useful though they could throw the gun or whiteboard at the shooter I suppose. Libby, good comments. I agree about the training. I mentioned some other issues in a post I wrote in January about a school district in Ohio that planned to arm its janitors.